← Who should you tell about your cancer diagnosis? Today I thought of my chemo days. It’s the kind of event you can’t completely forget about. As I reflected I realized it was not all bad during my cancer mess. I received great support, and those were the memories that came to mind – some of the sweetest things that happened to me during my cancer treatments that contributed to my recovery. So before my chemo brain gets the best of me, I thought I would write them down so I can always remember them and feel grateful. 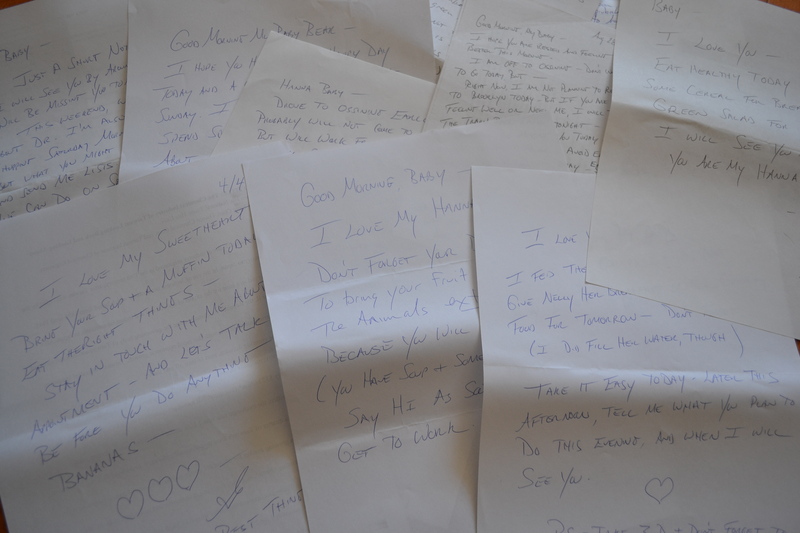 My fiancé’s mornings’ notes: Every morning when I opened my eyes there was always a note written by my guy before he left for work. My mom’s persistence on how bathtubs are full of germs: I stayed in her house during treatments, and she would clean the bathtub everyday so I did not catch an infection in my toe nails – due to my weak immune system. Even after 3 months of being finished with chemo, I would still catch her cleaning the bathtub for me. My sister’s correction of physics: I was wrapped in a blanket in the chemo room because I was always cold. She noticed the blanket, which was pulled up under my chin, had started to slip down my neck. She made sure to tuck it back up where it belonged and patted it gently. My cousin’s vulnerability: My cousin Bryan who visited me from the Dominican Republic sat by my side after I was done with one of my chemo infusions. He is usually a very talkative kid, but on that day he just looked at me and wrapped his arms around me. My aunt’s and uncle’s visits (from the Dominican Republic): My aunt Rossy took care of me during my two surgeries (for a month)—helped me clean my apartment, fed me, prayed for me every night, helped me shower, came with me to my appts., was with me during my surgeries at the hospital, took me to church. And my uncle who came to be with me for one of the chemo treatments and stayed in the chemo room for the entire infusion. Then, a few weeks later, he sent his three kids to cheer me up. My younger cousins’ letters: This still makes me smile. 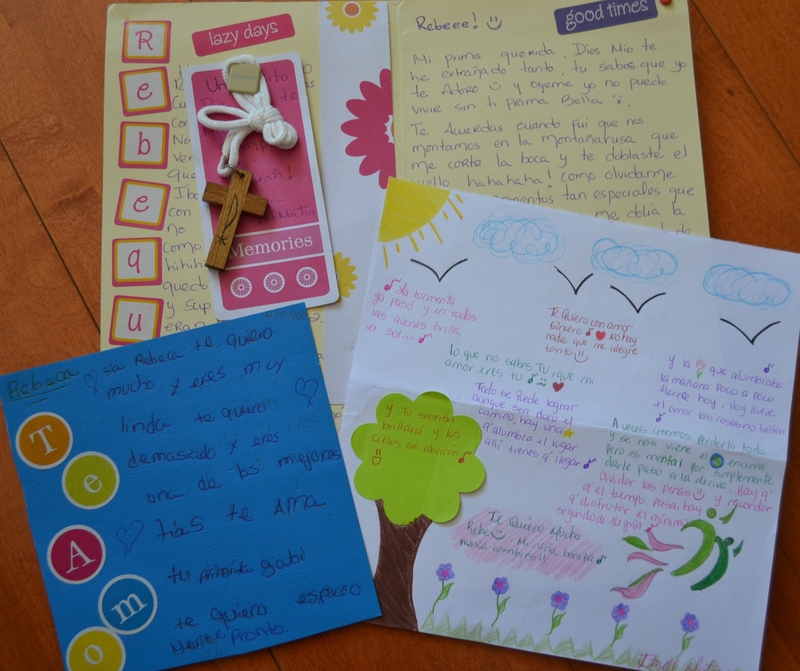 There were letters and cards my cousins created just for me. They could not come to visit me but they made sure I received their love. Religious competitions: There are Christians, Catholics and Saint believers among my friends and family. It was sweet to see each one of them claiming their God/Saint was helping with my recovery and not the others. Hey, as long as I was recovering, it didn’t matter who did the job. My cousin’s visit from Mexico: Cooking is not her thing but she persistently wanted to cook me a meal. I love to cook so I ended up cooking for the both of us. Why not? I had the energy. So allowing me to be self-sufficient was more than I could ask for. My great-aunt’s revelations: Although I can’t list them all, there is one I must mention. She said “I love you” to me. If you knew her, you would realize this is a big deal. She is not the kind of person to express her emotions, in any shape or form. Co-workers: I had a bag full of goodies waiting for me at my desk one morning. All kinds of healthy foods to bring with me during chemo—even Biotene which helped prevent mouth sores. One texted me every day for the whole 5 months of treatment—from asking me how I was doing to sending me stories she made up about how Christopher from the Sopranos and I had a love affair. Another one handled some of my projects at work. They even did a walk in support of me that year. 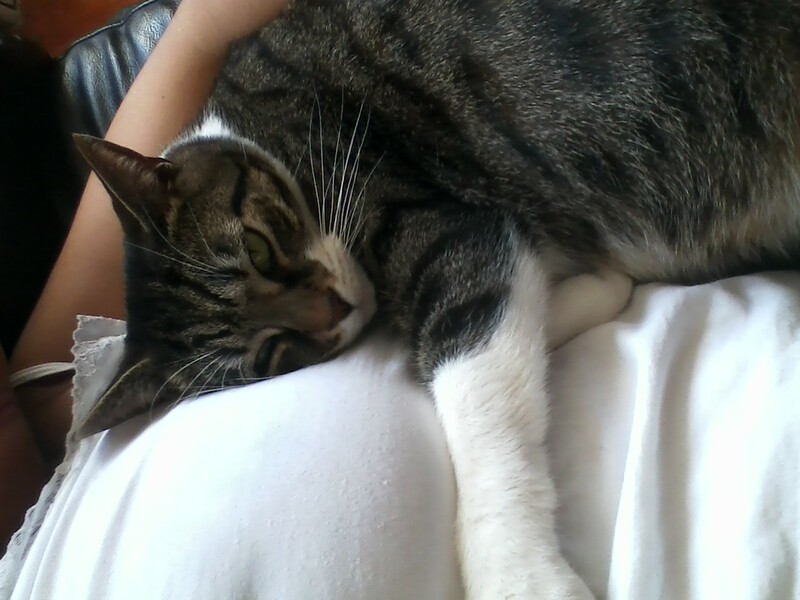 My cat’s hugs: My cat is not affectionate, but she didn’t leave my side when I finally returned home from treatments. For once, I saw winter as a blessing rather than a bad reminder in my life: Everyone who knows me knows I dislike the winter. It’s a combination of things: I’ve received a lot of bad news in the winter, for example – losing my mama and great-aunt, being diagnosed with breast cancer and my aunt being diagnosed with leukemia. One day, it snowed heavily, and I went outside and uncover myself to let the snow touch my face and arms. For that moment I forgot about all the cancer associations and simply enjoyed the experience of being able to see another winter. My friends: They slept over to be with me. They did not question anything which I appreciated. They were simply there to listen and to help. Roberto: He took care of my animals for months while I was getting treated – made sure they ate and were OK. He was with me when I shaved my head. I saw his tears when I got diagnosed with cancer, but he always told me that I would be OK.
Roberto’s family: The Santuario Del Quinche is a catholic church in Quito, Ecuador. This church is the home of the Virgen del Quinche who is known to be miraculous. Roberto’s family is devoted to her—many people from Ecuador are. They visit this church every year for the Peregrination. Roberto’s grandparents attended to request my healing. 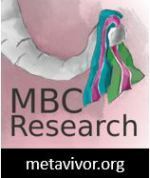 Other cancer patients: This post wouldn’t be complete without mentioning the most powerful group of people I’ve ever known, my sisters and brothers who have walked the cancer path. And here’s what I mean by powerful: they were the only people who could truly calm me down and get my head clear about how to proceed. They gave me advice. They listened. Kept my spirit up. Cheered me up. Educated me. Each one of them had a special touch and a way to simply make me feel confident about my situation. I consider them family. My medical team from MSKCC was and continues to be amazing: Dr. Chau Dang, Dr. Beryl McCormick, Dr. Mahmoud El-Tamer and the wonderful group of nurses who supported me during this difficult transition. I want to take the time to thank everyone who was there for me during those challenging times. I can’t imagine having to go through those treatments without their support. Did you have a sweet experience during your cancer treatments you would like to share? This entry was posted in Family, Reflections, Support and tagged Fortunate, Grateful, Thanks. Bookmark the permalink. I have to agree, Allie. We’re blessed to have a support system. I consider myself lucky x 3. In my company, we have three major religions represented, and I’m pretty sure I’ve got my bases covered. Alan, I never mind prayers — I welcome them all. Glad you got all your bases covered. Thank you. I def. feel blessed. May your blessings multiply. great post – I loved the positivity and love streaming out of the sentences 🙂 I agree with one commentor above that you sure were loved! All the care and kindness people who love us (or understand us, like other cancer patients you mentioned) showing during unusual times always make me emotional. My best wishes to everyone who made such nice experiences possible for you; may they get a similar experience should they find themselves in a difficult situation. Thank you. Yes, it is amazing how a dark experience can bring in so much light from different directions (not giving credit to cancer). Each light was essential to my recovery and I am grateful I had that. I too wish the same level of kindness to every person who experiences a challenging time. I love what your fiance did for you! How sweet! I feel the same as you do. There was so much kindness from so many people during my experience. Thank you, Carrie. I am happy you had, and continue to have, a great support system. We are truly blessed. What a beautiful kitty! Thank you for including a picture of her! Thank you, Wendi. Nelly means a lot to me. She also rules my home. Hey Scott!! Thank you for your support. Hope all is going well. Hi Rebecca, latest exam showed no cancer, lots of pre-cancerous growth removed but none of it running wild in my body. Also managed to repair some damaged relationships and rebuild a local care network which I’ll blog about soon. Have you heard of Shlomith Rimmon-Kenan? She wrote a book called “Narrative Fiction” that looks like a good writing guide. She was noted in an article as: “Ultimately, Rimmon-Kenan seeks not to reject phoenix narratives or narratives that strive for coherence, but to make room for those narratives structured more around chaos than epiphany or continuity.” I like the notion of not always structuring the writing as “meaningful” or carrying a purposeful message. (Helps that I naturally don’t make sense anyway–getting me off the hook for practicing a new skill). BTW, reading this blog improved my attitude going into the exam. Hi Scott, thanks for sharing your great news! I was complaining to a nurse recently about how some of my existing friends don’t get the post-cancer me and she enlightened me by saying, “get new friends. They won’t know who the old you used to be, they’ll only know the new you.” I am happy you’ve accomplished doing this. I haven’t heard of this author you mentioned, and sadly I don’t read as much as I’d like to. There’s a long list of books I would love to start reading so I’ll be sure to check out Shlomith Rimmon-Kenan. I am looking forward to reading about your local care network. I hope you’ll also write about your new-and-improved attitude. Bet my reading list is longer than yours:-) Good advice from the nurse, though a bit sad too. One of the reasons we moved to Canada was to leave behind the dynamics of a number of toxic relationships that grew from the 60’s West Coast culture. One power stronger than a person’s own baggage is the role their acquaintances put them in. Do you send your friends to the psychiatrist to clean up their dysfunctional attitude towards YOU? Better to say goodbye. And it’s not all them or even their business, you care for yourself and your relationship with others. Start reading again with the “The Untethered Soul, the journey beyond yourself” by Michael A. Singer. Made me realize I can release myself and others from MY problem with them–it’s really not such a complex thing.